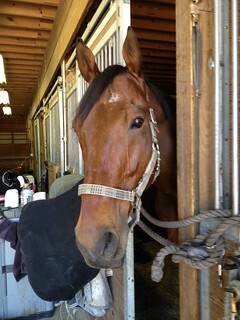 Last night I had an uncharacteristically bad ride on Manny. His normal enthusiasm felt more like resistance – I couldn’t get him to soften his braced neck. We worked half halts and transitions, but I couldn’t get him through. I was disappointed, and the ride really bugged Christy too. Tonight I gave it another shot. After I warmed up, things were better but still not great. At Christy’s suggestion, I shortened my stirrups a hole. Presto. I felt solid and balanced, and Manny appreciated it. We got our act together, and I was able to practice riding him out to the contact, while keeping my hands above his wither, where they belonged. While the ride was going better, my ankles were feeling the effects of the shorter leathers. My ankles are stiff, and I don’t seem to have much shock-absorbing flexibility in them. When I’m in two-point, Christy often asks me to relax my ankle downward – and I can’t. My heel doesn’t go much lower than my irons. Anyway, I was really feeling the burn, so I dropped my stirrups and took a break. 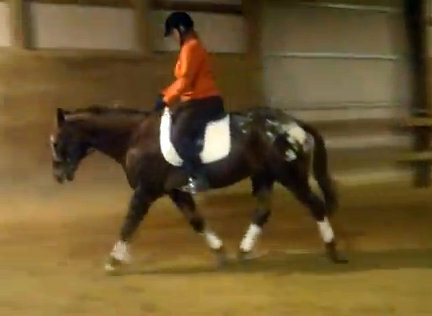 Then I looped them across Manny’s withers for some no-stirrups torture. To my delight, I was actually able to hold myself in decent carriage this time around, and I was able to encourage Manny to reach for the bit a little, and round. I was feeling solid in my position, so I did something that I haven’t done for about 5 years. 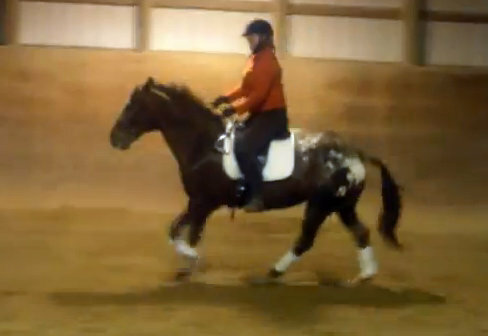 I cantered with no stirrups! Christy was sufficiently stunned. And I’m happy to report that it felt wonderful. Going left, we picked it right up. Going to the right, I had to work a bit more. Manny’s a bit stickier to that direction, and so am I. Our first transition didn’t happen – I just got a racing standardbred trot, but I was feeling so good in the saddle that it didn’t bother me at all. I was able to half halt, put him back together and ask him again. On the second try, I got the canter, but I didn’t successfully ride it as long as I wanted to, because by this point, I was getting tired. Manny dropped to a trot before I asked, but at that point, I needed a breather. We walked a bit, and then gave it another try. The third time was a charm. The transition was fairly prompt and I held it until I was done. The tweaks did the trick, and Christy told me we redeemed ourselves from last night’s yukko effort!